In the shadowy world of highsec miner bumping, things are not always what they seem. Though people rate honesty and transparency as among my most prominent characteristics, I will occasionally hold things in confidence. When that happens, however, I will do my utmost to get people the truth they deserve--without compromising operational security. Today, that is what I do. Some time ago, when things first heated up in Kino, I was bumping a stubborn miner who refused to pay my mining fee. But later, I received a convo request. That miner had an indecent proposal: He would pay me, but only if I bumped someone at his request. For reasons unknown to me, he had a vendetta against another highsec miner in Kino. 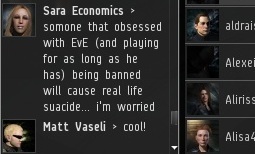 Since I was going to get around to bumping Sara Economics anyway, I decided to accept the 10 million isk mining fee and bump at no extra charge. James 315 > why is she popular or something? It seems Ms. Economics was a popular fixture in Kino, and had two fanboys which the miner identified by name. Not too long after I began bumping Sara Economics, those two attacked me, and I quickly defeated them as I recounted shortly after it happened. Now you know the rest of that story. XXXXXXXXX > anything good drop? By all rights, that should have been the end of the story. But it wasn't. While bumping her and afterward, Sara Economics loudly proclaimed how little she was inconvenienced by the bumping. But after I left, she let her true colors show. Ms. Economics was furious about my bumping and was convinced that I was breaking the rules with an invincible exploit. As my Agents reported, and as I informed you earlier, rumors spread that I had been banned. Sara was among the first to petition me, desperate to get me permabanned from the game. 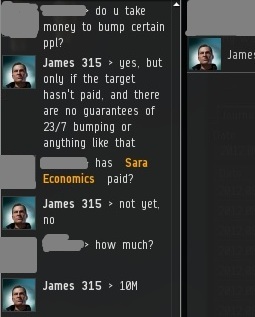 Sara convinced herself that her prayers and petitions had been answered, and that I was kicked off by CCP rather than logged off of my own volition. Even that wasn't enough. 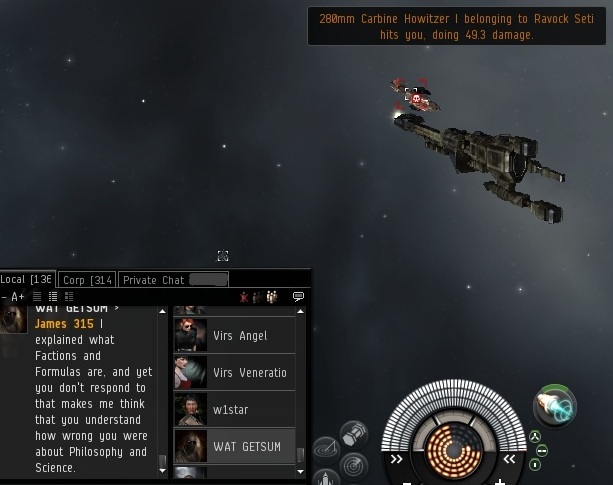 Still consumed by hatred after being bumped out of mining range a few times, she went on a multi-day rant about how much she hated me and everything I had done. 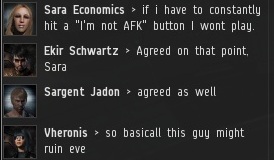 As I was out of the system nearly all weekend, I only knew about this thanks to the hard work of my loyal Agents, who keep me informed of everything that goes on in highsec. ...All while I was being awesome somewhere else, blissfully unaware of the strife left in the wake of my bumps. All the while, she had no idea this was all caused by one of her fellow Kino miners, who wanted me to bump her and was willing to pay for it. That might be something for the Kino locals to keep in mind--that friendly mackinaw pilot mining next to you might be secretly plotting a bump! There's more yet to be said on the subject of miners contracting bumps, but that's a story for another day. You should really apply for a news anchor at Fox. Your propaganda spinning tactics would fit right in there. "...All while I was being awesome somewhere else"
I genuinely chuckled for several good minutes, not because it's un-true but the delivery was fantastic. I do see a wee little bit of red, just at the tip there. Anyone else see it?